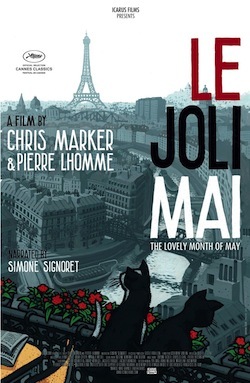 Long unavailable in the U.S., the landmark 1962 cinema verite feature Le Joli Mai finds master filmmaker Chris Marker examining the “first spring of peace” in France (after the end of the Algerian War). Marker, his co-director Pierre Lhomme and their crew conduct “man on the street” interviews to see what Parisians are concerned about — the answers range from colonialization, strikes and racial inequality to the twist and making clothing for cats. The film was last seen on a wide basis over here when it aired on Bravo (back when the network was an arts channel) in the mid-Eighties. At that time the version in theatrical circulation was a two-hour cut prepared for the Anglo market by Marker, with Simone Signoret (Diabolique) reading Marker’s often poetic narration in English. This long-awaited two-disc DVD release includes the full film as initially seen in France back in ‘62, with both the Signoret English narration and the original French narration by Signoret’s husband, the great Yves Montand (Grand Prix). Icarus has thus taken care to offer viewers a number of audio and subtitling options. The only odd thing about the otherwise welcome re-integration of the missing 26 minutes of French footage is that the “Signoret track” often reverts to her husband’s French narration, since he was introducing footage that was cut for America and the UK. Le Joli Mai documents the "first spring of peace" in France following the Algerian War. In the accompanying booklet, Lhomme declares that there never was a definitive version of the film, since it was screened once by Marker in a seven-hour version(!) and a few years before his death in 2012, he asked Lhomme to cut a 17-minute chunk from the French version (running 165 minutes) — which is present here as a “deleted scenes” extra on the second disc. This footage contains very interesting material relating to the Algerian War and quick glimpses of a theater audience that includes Marker’s close friends Agnes Varda and Alain Resnais (Wild Grass). The booklet supplies a number of fascinating insights into Le Joli Mai, but one of its features is definitely worth a skim before viewing the film. “Points of Reference 1962” offers a list of historical terms and events used in the film that can situate some of the sequences for American viewers. The best moments in Le Joli Mai work, however, whether one does that brief bit of research or not: a young newlywed couple are interviewed shortly before the husband reports for military duty in Algiers; an African immigrant describes his mixed feelings about white people; and an Algerian student recounts the time he was beaten by state police in front of his parents. The film is quite important in Marker’s career, as it represents a turning point in his work. He made Le Joli Mai in 1962, the same year he crafted the classic sci-fi short La Jetee. 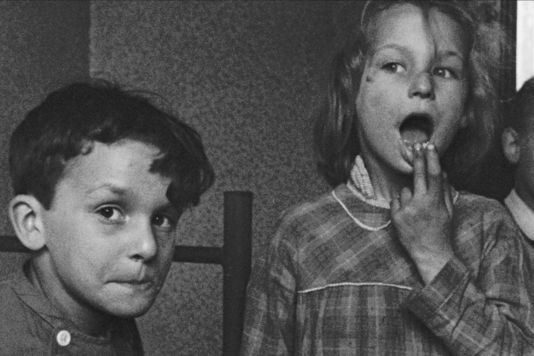 Mai is thus the culmination of the more conventional documentaries Marker had made before ’62, and La Jetee pointed toward the imaginative, often playful “essay” features he made afterward. That said, there are some wonderfully playful moments here. Lhomme noted that Marker and he didn’t want to edit down the interview subjects’ answers, so one of the freshest (and Marker-like) scenes in the film demonstrates how the filmmakers kept the responses intact while keeping the viewer awake. As two social engineers discuss the rigors of everyday living at some length, Marker cuts away to images of cats (his favorite animals, along with owls). Shortly thereafter, when the somewhat dull-sounding engineers bring up those who are non-producers in society, Marker inserts quick shots of his friends: Godard, Rivette, Resnais and Jean Rouch (who codirected Chronicle of a Summer, the obvious model for Le Joli Mai). The only (small) drawback at all in the package is the occasional use of white-on-white subtitles — at points a French title will appear on the screen and the English title translating it is laid right on top, rendering it illegible. The extras included in the set are invaluable, as they both explain the film — as with the essays and a new interview with Lhomme in the booklet — and show the clever uses to which Marker put the 50 hours of footage shot for the project. Two upbeat shorts directed by, respectively, a writer on Le Joli Mai and the editor of La Jetee, are comprised of footage not used in the film, set to Michel Legrand’s score for the feature. Le Joli Mai might not be the single best entryway to Marker’s very special world — The Case of the Grinning Cat, the La Jetee/Sans Soleil Criterion release, or his authoritative docu about the late Sixties, Grin Without a Cat, are more appropriate in that regard. But Mai is indeed a priceless portrait of a country in transition; it displays the reality that lay underneath the hip, glamorous Paris-set films the French New Wave made around the same time.